It has occurred to me in the past few weeks that I have numerous friendships that many wonderful recipes have come from. I make friends with these lovely, beautiful inside and out people, and because we share a love of cooking, and yes food, we end up sharing our favorites. They are not the reason we are friends, but the recipes become these tentpoles of our friendships. We know their family through these recipes, even if we have never met their family. These recipes become part of our story. The food that feeds our kids during parties, the meals that we bond over, reveal secrets over (along with a glass of wine). It’s just what friends do!! For example, the other day, I wanted to make my favorite quiche recipe which comes from my friend Alayna. I adore quiche and this recipe is the real deal. It comes out perfectly every time and I always feel like a brilliant chef when I am serving it up for a brunch. She wrote the recipe down for me long ago and I have sense lost it (I know!!) and has texted it to me several times as well. I texted her AGAIN to get the recipe. She texts back with one of her witty responses, followed by the recipe and then “I swear we just use one another for recipes!” Though I knew she was kidding, it gave me pause for a minute. I am a sensitive person and don’t take most things as lightly as they are intended. We go back and forth with the witty banter that makes us good friends and it is decided that we don’t see one another often enough and this is likely due to us being busy cooking. So then a few days later, she texts me about what to do with leftover cornbread and I say cornbread salad! And the circle continues. A week or so ago, I texted Betsy for a the recipe for her mama’s sundried tomato basil chicken pasta recipe. Again, with 8 kids and super busy schedules between us, not to mention the 3 1/2 hour travel between us, we don’t talk to or see one another nearly as often as we would like. But that doesn’t make us any less of a friend to one another. Good friends don’t need daily interaction to stay good friends. A good, quality friendship is always there, unchanging and unaffected. Sure it’s a good idea to do something to nourish those relationships and keep up best you can but a good friend is for life. Just last week, as I was about to board a flight to Honolulu (yes Honolulu…cajun mama travels albeit reluctantly) I get a text from Betsy encouraging me to have fun and not worry. Why? Because she knows me, has experienced first hand how hard it is for me to leave my kids, and break away. And in many ways her text put me at ease. It reminded me what I am made of and also what a good friend I have in Betsy. My point here is, maybe our texts do revolve around forgotten recipes but it keeps us connected. Despite the miles, the kids, the exhalation and the busy schedules, we remain close somehow. And Alayna and Betsy are just examples. I experience this with different friends. Recipes have a way of doing that. They bond us, draw us together, and keep us connected. 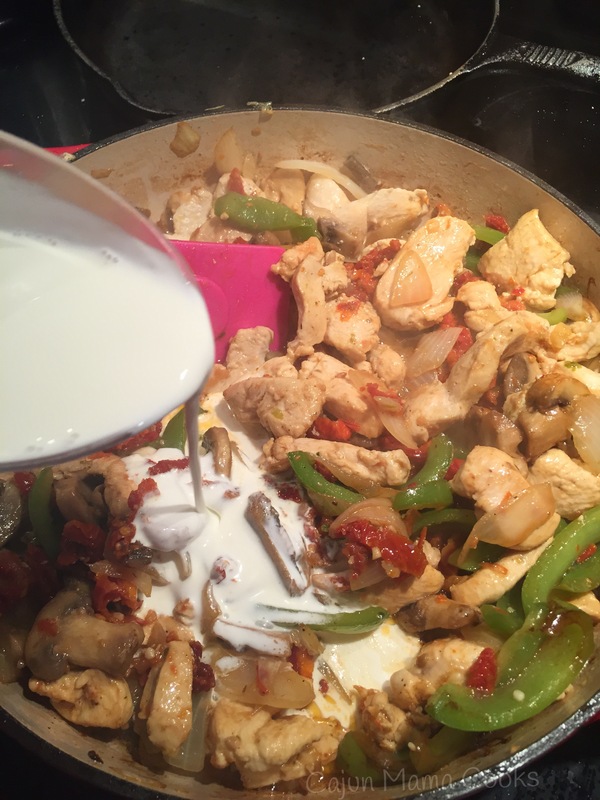 Now the recipe for Alayna’s quiche went in my column in the May issue of Red River Moms (and I will share it here soon) but today I am sharing the recipe for the Mrs. Sharon’s sundried tomato basil chicken pasta. And you will see just how insanely delicious one recipe can be after you make it. One bite and you will be SOLD!!! This is a filling pasta dish that is so flavorful and hearty, even the manliest man will appreciate it. But it is also perfectly at home on the menu for a ladies’ luncheon. Drain oil from tomatoes and reserve. 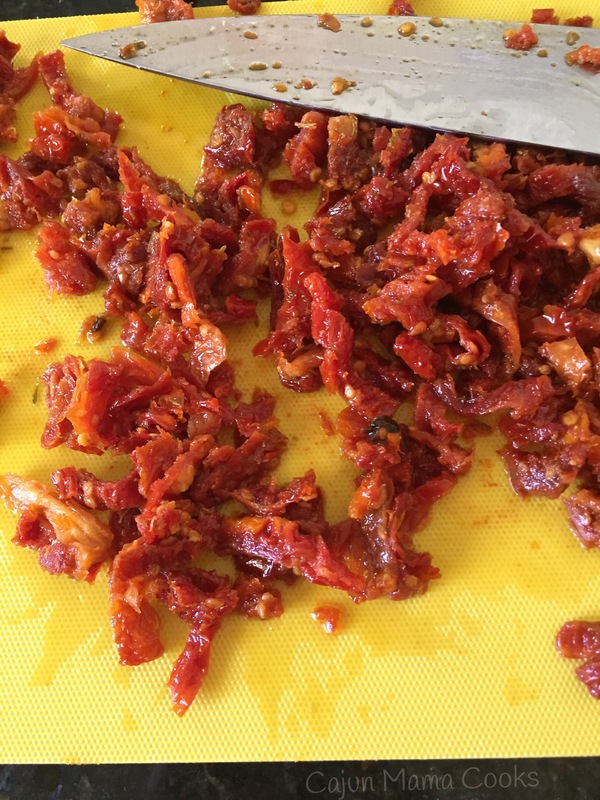 Give the sundried tomatoes what PW calls a “hard chop”. Does not have to be perfect or uniform just chop them up some. Now, add some of the reserved oil to a large skillet and warm it over medium heat. 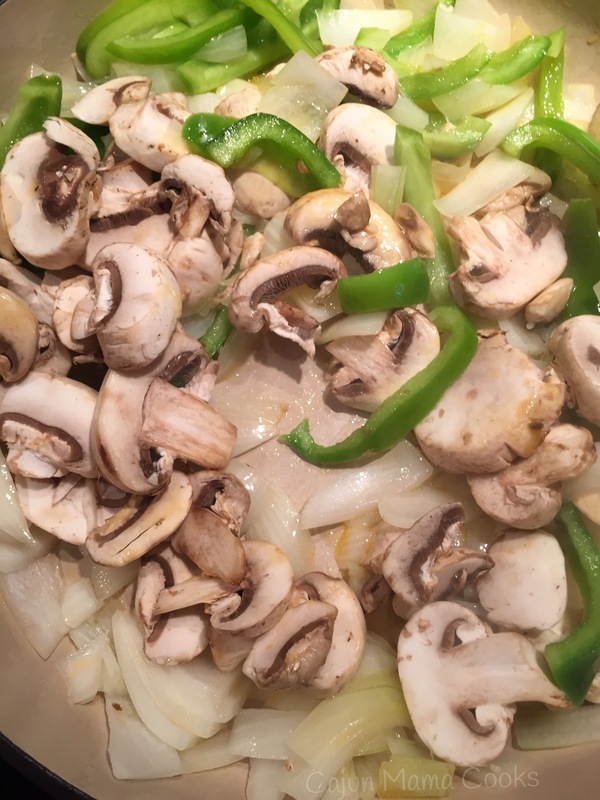 Add slices of onion and bell pepper to the pot. Sauté them for a minute or two and then add garlic and mushrooms. Ok! Now, pour in that luscious cream. Oh yeah…it’s good to be you. So, I moved my friend and my conversation into the kitchen where I could fire up the old stove (well not really that old) and get that meatloaf going. Far be it from me to stand between a preteen boy and his food. I had that sucker made and in the oven in no time and it was a HIT!!! My daughter had a friend over and the child went nuts over this meatloaf. Everyone loved it and wanted more. P.O. even ate the leftovers for supper tonight. Yep. It was that good. I served it with either pasta topped with the leftover marinara sauce or Alfredo sauce. We have two different kinds of palates here and sometimes I indulge both. It is spring break after all. I also picked up loaf of French bread to slice up and serve warmed along side it with a nice green salad. It was perfect and will be made again soon. It really is delicious and worth taking a chance on. Let me tell you how to do it. You are gonna blow your family away!! Preheat your oven to 400 degrees. Sauté onion and bell pepper in some olive oil until tender. Add garlic and sauté another minute or two. Add the your ground beef and Italian sausage to a large mixing bowl. Add in sautéed veggies and other ingredients, except the Marinara sauce. Reserve one cup of the cheese for topping but add in the rest. Now, roll up your sleeves or use a wooden spoon, but mix it up good until all the ingredients are combined. Don’t be skeered of that meat! Shape the meat into a loaf and add to a loaf pan or a pan of your choice. I use a 9 X 13 glass dish and it works beautifully. Spread the marinara all over the top of that meatloaf. Bake in a preheated oven for 40 minutes. The original recipe called for 50 minutes but mine was done in 40. Adjust accordingly for your oven’s cook time. Add the reserved cheese to the top and bake another 5 minutes or so, until the cheese is bubbling and melted and irresistible. Allow to cool a few minutes, slice and serve. Enjoy my friends!!! You don’t have to make a fancy meal that takes tons of time and money to prepare. What matters is serving up something (mostly) homemade and the smiling (usually) faces gathered around the table. Time to talk, come together and nourish our spirits and bodies. That is what we are going for. This recipe can do it for you. Let me know what you think! !